8am-outside air temp-75 degrees, warmed to 80 by mid-day. The water temperature is still 73 degrees and we had 30-foot of visibility with a gentle north current. Crew-Tom Campbell, Carmine Dilorenzo, Peter de Villers, Ken Udell and myself. Bruce Paul drove the boat. What better way to celebrate Valentine’s Day then in the ocean, catching our own spiny lobster for dinner. Our wives are counting on us getting fresh lobster for Valentine’s Day, and with the large amount of lobster we’ve seen the last few months, it made it a guaranteed request today. I dove with Ken as my dive buddy while Carmine, Peter and Tom dove together. It’s nice having Bruce drive the boat and keep tabs on both sets of divers. We were successful in almost catching our limit of lobster, which made our Valentine’s Day even better. We dove off Pompano Beach and Lauderdale-by-the-Sea on both the second and third reef. 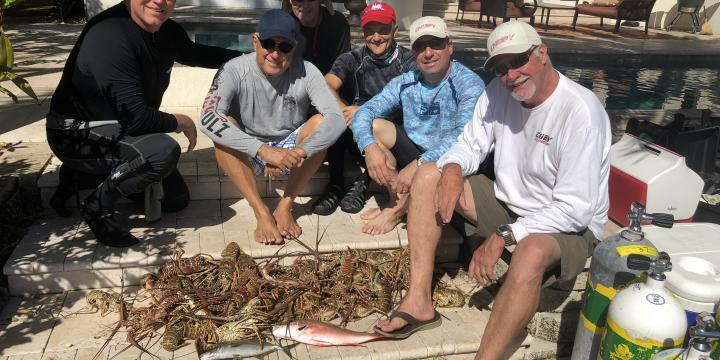 The second reef has been very productive for finding spiny lobster and it was fun for Ken and me to team up and get a bunch. The third reef is located with west-facing walls rising from 65-feet to 50-feet. We’ve been finding lobsters on these walls, but they’re challenging to capture, as there’s deep crevasse and overhangs. This is usually the best spot for fish, and we saw groups of Gag Groupers, however, it’s not the season to get any. It’s still a great day with a group of good dive buddies. Valentine’s Day on the ocean is a way to express your “love of the ocean”…and today was one of those days.